Akshaya Tritiya is Your Time to Buy Gold, Differently! Want to invest in gold but are waiting for the making charges to drop? Or worried where you will store your physcial gold? What if we told you that a fund allows you to invest in the asset class of your choice (gold) and you do not incur any making charges or storage hassels! Presenting the Quantum Gold Fund ETF (QGF). QGF invests in Physical Gold. It seeks to offer investors an innovative and cost-efficient way to invest in gold. Each unit of the QGF will be approximately equal to price of half (½) gram of Gold. Through the lower cost of operations and the availability of units having smaller denominations, QGF would provide investors an excellent means of asset allocation. Please note that you need a demat account to invest in QGF. 1. Affordable: Only Gold ETF where 1 unit represents ½ gm gold. 2. Pure: Backed by gold of 0.995 finesse. 3. Convenient: Call your broker to buy ‘QGOLDHALF’ (S&P BSE & NSE code) like an equity share through your trading account. 4. Value: Trades like an equity share on the exchange - in tandem with domestic gold price. 5. Protection: The gold is stored in secured vaults and also insured. Solution For: Your investments in Gold, helping you bring diversification to your portfolio. Mr. Chirag Mehta is the Fund Manager effective from May 01, 2009. @ Indicates the current value of Rs. 10,000/- invested at the beginning of a given period. Different Plans have a different expense structure. Returns are calculated on the basis of Compounded Annualized Growth Rate (CAGR). What is Quantum Gold Fund or QGF? Quantum Gold Fund is an Exchange Traded Fund also known as ETF. ETF units are listed on stock exchanges and traded like equity shares. An ETF would have some underlying security or group of securities like an index, sector stocks or commodities, like gold. These underlying securities determine the ETF’s value. A Gold ETF is fund that has gold as the underlying security. So, the value of the ETF is derived from the value of underlying gold. Gold ETF would be a passive investment; so, when gold prices move up, the ETF appreciates and when gold prices move down, the ETF price comes down. As Gold ETFs track gold prices, the only differentiating factor would be the costs borne by the Fund House. Quantum Gold Fund – QGF is an open ended Scheme Replicating / Tracking Gold, will invest in Physical Gold. It seeks to offer investors an innovative and cost-efficient way to invest in gold. Each unit of the QGF will be approximately equal to price of half (½) gram of Gold. Through the lower cost of operations and the availability of units having smaller denominations, QGF would provide investors an excellent means of asset allocation. Investor looking for Portfolio diversification under Gold asset can invest in QGF. • QGF helps to diversify your investments across third asset class which is GOLD other than Equity and Fixed Investments or Bonds. • QGF takes away your worry about quality as the gold backing the ETF is sourced from London Bullion Market Association approved refiners. • QGF takes away your worry about storage and thefts as the fund house takes care of all risks of storage and safety for a minimal expense ratio. • QGF helps to stabilize your portfolio against negative events as it is less volatile compared to equity. What is the Investment Objective of the Quantum Gold Fund? The Investment Objective of the Scheme is to generate returns that are in line with the performance of gold and gold related instruments subject to tracking errors. However, investments in gold related instruments will be made if and when SEBI permits mutual funds to invest, in gold related instruments. The Scheme is designed to provide returns that before expenses, closely correspond to the returns provided by gold. What are the different features available under the Quantum Gold Fund? Systematic Investment Plan, Systematic Transfer Plan and Systematic Withdrawal Plan are not available under QGF. Investors can avail of these facilities by investing in the Quantum Gold Savings Fund. Click here to read about Quantum Gold Savings fund. Investors do have the option of regularly buying units from the listed exchanges and accumulating their QGF holdings. Where will the Quantum Gold Fund invest? What is the Current portfolio? The AMC uses `passive` approach to try and achieve the Scheme`s investment objective. The QGF will invest up to 100% but at least 90% of its total assets in the physical Gold. Quantum Gold Fund endeavors to track domestic prices of gold by investments in physical gold. 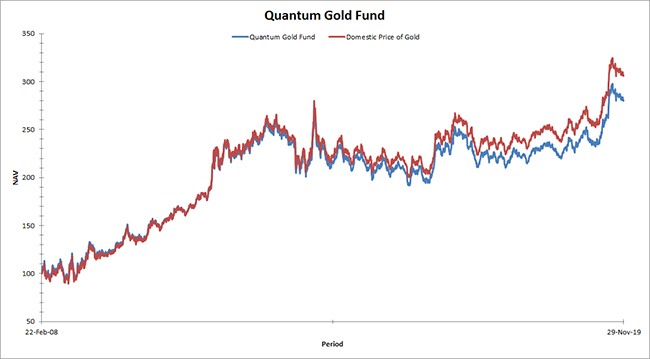 Click here to view the current portfolio of the Quantum Gold Fund. What is the Benchmark of the Quantum Gold Fund & Why? The Benchmark for the Scheme is domestic price of physical Gold. The scheme would primarily invest in physical gold with an investment objective to generate returns that are in line with performance of gold and gold related instruments. Hence, the benchmark is chosen as it is most suited for comparing the performance of the scheme with regard to its stated objective. Who is managing the Quantum Gold Fund? Mr. Chirag Mehta is managing the scheme. Chirag Mehta has more than 11 years of experience in handling commodities. Chirag is a qualified CAIA (Chartered Alternative Investment Analyst), and has also completed his Masters in Management Studies in Finance. He has interned at Kotak & Co. Ltd and has also attended the Federation of Indian Commodities Exchanges as part of his internship. The minimum amount of investment will change according to the category you fall under i.e. Retail Investor and Large Investor or Authorised Participants (AP). Retail Investors- On the Exchange: Approx. equal to price of ½ gram of Gold quoted on the NSE. On NSE, the units can be purchased /sold in minimum lot of 1 unit and in multiples thereof. To read more on minimum amount for Large investors/AP please read the SID of QGF or please click here. Quantum Gold Fund is listed on the National Stock Exchange (NSE) with the symbol QGOLDHALF. You can buy/sell Quantum Gold Fund units on the National Stock Exchange, through your stock broker, or through your online trading service. Each QGF unit is approximately equal to ½ gram of gold. The investment process will change according to the category you fall under i.e. Retail Investor and Large Investor or Authorised Participants (AP). • Units of the QGF will be issued and settled compulsorily in dematerialized form. So you should have a Demat (beneficiary) account with a depositary participant of NSDL or CDSL. • You can buy QGF units on the capital market segment of NSE, during trading hours at a price which may be close to the NAV of the Scheme. • You have to instruct your broker to buy/sell QGF units and pay the transaction amount to him. • Also give standing instructions for "Delivery-in" to your DP for accepting units in your Demat account. • After the execution of trade; the broker will transfer the QGF units directly to your Demat account. • If you trade online, you can input buy/sell orders on your system at your convenience and pay the broker online. QGF can be found under the equity section, and not mutual fund section, of your online trading service. Who can and cannot invest in the scheme? Click here to view the entire list of who can invest? Click here to view the entire list of who cannot invest? What is the current expense ratio of the Quantum Gold Fund? Current expense ratio is 1.03% p.a. with effect from July 1, 2017 (Post GST). Effective 01 Dec 2018, the base TER has undergone a change, however the Total Expense Ratio remains the same. What are the entry and exit loads for the Quantum Gold Fund? It should be noted that Quantum Mutual Fund has not charged Entry Load for any of its schemes since inception. We were one of the first mutual funds in India to launch schemes with no entry load, much prior to SEBI discontinuing the same. There is No exit load if you wish to redeem from the scheme. (Retail investor can exit the scheme only through secondary market). What are the different options/facilities available under the Quantum Gold Fund? The Quantum Gold Fund offers only Growth Option. Can I hold the units of the Quantum Gold Fund in Demat mode? The units will be issued only in dematerialized form through depositories. To avail the same you should have a Demat/beneficiary account with a DP. How has the Quantum Gold Fund performed? To check the performance of the scheme you will have to go through the current factsheets. Click here for detailed Scheme Factsheet. Tell me more about the NAV applicability and cut-off timing of the Quantum Gold Fund. I) The Fund creates / redeems units of the Scheme in 'Creation Unit Size' which is exchanged for portfolio Deposit which would consist of physical Gold of defined purity and quantity and Cash component. The fund declares the Portfolio Deposit or Cash Component on the website / www.QuantumMF.com and the same would be applicable for creating and redeeming unit size for that Business Day. (i) In respect of valid application received from Authorised Participant / Large Investor along with the Portfolio Deposit and / or Cash Component, up to 3.00 p.m. on a Business Day at the official point of acceptance, NAV of the day on which the application is received shall be applicable. (ii) In respect of valid application received for purchase in Creation Unit Size, from Authorised Participant / Large Investor along with the Portfolio Deposit and / or Cash Component after 3.00 p.m., on a Business Day at the official point of acceptance, the closing of NAV of the next Business Day on which the application is received shall be applicable. (iii) In respect of valid application received up to 3.00 p.m. on a Business Day at the official point of acceptance, NAV of the day on which the application is received shall be applicable. (iv) In respect of valid application received after 3.00 p.m. on a Business Day at the official point of acceptance, the closing NAV of the next Business Day on which the application is received shall be applicable. As the Units of the Scheme are listed on NSE, an investor can buy / Sell units on continuous basis on the capital market segment of NSE during trading hours like any other publicly traded stock at prices which may be close to the actual NAV of the Scheme. Tell me about the Tax implications if I invest in the Quantum Gold Fund.